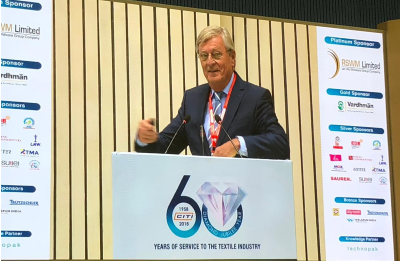 IAF President Han Bekke and Secretary General Matthijs Crietee on Tuesday November 27th attended the the Confederation of Indian Textile Industry’s (CITI) Global Textiles Conclave 2018. Han Bekke led a panel at this conference which included representatives of PVH and JC Penney, Birla Century and the Sri Lanka Apparel Exporters Association. The event was opened by India’s vice-president Shri M. Venkaiah Naidu and India’s textile minister Smt. Smriti Zubin Irani and very well attended. Our immediate past president Rahul Mehta (CMAI) was also a speaker and moderator and he arranged for a private meeting with the textile Minister at her office at the Ministry. The Minister announced plans for a restart of Size India and also a project on mapping the size and composition of the Indian apparel industry, both as advised by IAF’s Indian member CMAI.